Tell us what you would like to see in this newsletter... Simply fill in the this contact form and we will do what we can. Why not Share or Bookmark this site with your friends. Right since the beginning of 2012 Victoria Falls has seen increased numbers of tourist arrivals, and that trend has continued with many accommodation, tour and activity operations reporting increases. And it is not just Victoria Falls which is experiencing and upturn. Some figures suggest that Zimbabwe’s overall tourism economy is estimated to grow by over 9% in 2012, making it one of the fastest growing tourism economies in the world, and that the country is on target to achieve three million tourist arrivals for the first time since 1996. But the talk about town is all focussed on next year, when in August Zambia and Zimbabwe will jointly host the 2013 United Nations World Tourism Organisation’s (UNWTO) General Assembly in Livingstone and Victoria Falls. Hosting the Assembly will require investment and development on both sides of the river to provide the world class conference and associated facilities required for the estimated 5,000 attendees, including airport expansion works, road rehabilitation, hospital and water supply development. So take some time out and catch up with what’s been happening in the wonderful world of Victoria Falls. Please interact with us by letting us know, what you would like to see and also what you don't like, and of course share with us any stories you have that our readers will enjoy - Its easy click here and submit your story. September has been typically hot as the average daily maximum temperature rises into the 30's (C) before the coming rains will, eventually, bring relief. It is always an annual guessing game as to when the rains will break – although there have already been some rare sporadic showers reported in the region for the last month or so - but the rains proper are not expected for another month or two. Flood levels have been more or less within normal ranges after several years of high floodwater levels, with the river levels reaching their maximum peek in late April and early May. As the river level has dropped over the last few months (rafting resumed at the beginning of June, from rapids 14 to 25, with normal full day rafting introduced at beginning of July), wildlife has returned, with many birds returning to the region, and the river, to breed. Not only are we joined by migrant species from the northern hemisphere, such as the European swallow, swift, bee-eater and roller, but also what ornithologists call ‘intra-African migrants’, species which stay within Africa but migrate within the continent. One spectacularly colourful bird, the carmine bee-eater, returns to the Zambezi to breeding in colonies along the river. For safety from predators they nest in the vertical cliffs of sand exposed along the rivers edge by the falling waters. These birds are a rare sight around the Falls, as the river here flows over exposed basalt rock, but they are found in their thousands downstream in the Zambezi Valley, and can also be seen in the Chobe area of Botswana, only 50 km upstream of the Falls. Many insect-feeding species will begin breeding now in preparation for the glut of insect life which will follow the arrival of the rains, allowing them to rear their young at this time of natural abundance. Birds are not the only species to take advantage – frogs, snakes and small mammals such as mongooses and genets, all time the peek of their breeding activity in response to the rains, and the brief respite from the drought which dominates the rest of the year. There are new eating options in Victoria Falls town, offering visitors and residents some welcome culinary variety. Latest on the scene is ‘Wok ‘n Roll’, town’s first oriental take-away. Together with Lola’s Tapas which opened earlier in the year, the Falls is slowly developing a taste for global cuisine! Government officials reported in mid September that expansion of the runway at the Victoria Falls International Airport was progressing well. Work started in July, funded by a $150 million dollar loan from a Chinese bank. The development is part of a wave of infrastructure investment as the town prepares for the 2013 United Nations World Tourism Organisation (UNWTO) General Assembly. Chinese contractors have taken over the expanding of the runway to a length of 4 kilometres, enabling the new generation of bigger and wider aircraft, such as the Airbus A340 and Boeing 777, to fly directly to Victoria Falls. However officials and contractors have both acknowledged that the terminal buildings, which will home immigration, customs and airport flight control services, will only be completed after the event in August. Livingstone Airport (renamed Harry Mwanga Nkumbula International Airport in 2011) completed its expansion work this year. Earlier in the year Air Namibia increased the frequency of their flight services from Windhoek to Victoria Falls, now operating a daily schedule. Harare is also seeing more direct services, with international airline, KLM Royal Dutch Airline, introducing flights from Amsterdam to Harare in October, in addition to Emirates, who are expanding their five days a week service from Dubai a daily flights from October. However national carrier Air Zimbabwe continues to be troubled with debts, operational issues and flight suspensions. The new Victoria Falls River Lodge has quickly established itself as one of the places to visit, with an emphasis on taste – offering luxury tented lodge accommodation and fine dining. Situated on the banks of the Zambezi, the lodge is the first private concession within the Zambezi National Park upstream of the Falls. Victoria Falls Safari Lodge has also opened its new development, Victoria Falls Safari Club, a luxurious and private retreat located within its Safari Lodge complex just outside town. With 16 rooms and four suits, the Club is a perfect getaway offering the highest standards in service and comfort. It was also recently announced that Jenman Safaris plan to develop two new lodges under the name African Luxury Hideaways, and have been awarded a concession in Victoria Falls overlooking the Zambezi Gorge and another in Hwange National Park. The lodges are expected to be open in April 2013. In the last few years Hwange National Park has seen a number of new private lodges being developed within the Park, including Camp Hwange, Nehimba Safari Lodge and Camp Somalisa. Concerns over the development of the Park are balanced by the need to maintain and develop infrastructure, especially important in Hwange where there is no permanent water and pans must be pumped throughout the dry season to support animal populations. Tourism operators not only assist directly by managing and maintaining pans within their concession areas (Wilderness Safaris, for example, manage pump 16 pans) but indirectly through support and assistance to National Park staff and independent conservation charities and projects. As a result, increasing numbers of pans in Hwange are being managed efficiently and crisis drought situations, such as occurred in 2005, should be averted. The presence of lodge staff, guides and regular vehicle movement also help deter poachers who are known to operate deep into the park. The Victoria Falls Private Game Reserve recently welcomed another addition to its growing family of black rhino, with the unexpected birth of young male calf. The mother, Bambi, who is 35 years of age, had shown no signs of pregnancy, and the new arrival was a surprise for the staff and rangers at the reserve who monitor and protect the animals. Shungu, the father, has now sired four offspring to bring the total of rhino on the reserve to seven. The black rhino breeding project was initiated by Shearwater Adventures, who manage the reserve, and reserve owners Rani Resorts, in 2007. Game drives give visitors a chance to see these incredible yet highly endangered animals in their natural habitat. The reserve is also home to the International Anti-Poaching Foundation and their ranger training and anti-poaching operations. This is really awesome. I have been wanting to get this done myself for sometime now, but I see that someone else has done it. 360 degree views from above the Falls. It's totally interactive you can spin the camera around to see what ever you want. A new arrival on the scene is the Victoria Falls Tram, an authentically styled 19th century tram service, which operates a daily schedule via the rainforest (for entry into the Victoria Falls National Park and Rainforest cafe) and the Victoria Falls Bridge (for the Bridge café, bungee and other activities). Launched in September by the Victoria Falls Steam Train Company, the open-sided tram is a modern built replica of a classic 1890s model and seats just over 30 passengers. The service offers an interesting and novel option for getting down to or back up from the rainforest and bridge, which are both on almost every tourists ‘must do’ list. To walk down to the Falls is not so far, but after walking around the twisting pathways of the Victoria Falls Park and back and forth over the bridge, it might not be a bad idea to time your day so you can hop on for the uphill journey back into town! The tram, which travels at a leisurely 25 km/h, comes complete with onboard bar and refreshment service. The Victoria Falls Tram Company offers a daily special evening sunset bridge run, which includes champagne and canapés, providing refreshments and service on a par with the view. The setting of the Victoria Falls Bridge, with it’s unique view of the Falls through the neck of the Batoka gorge, was recently voted sixth in the prestigious BA Horizons awards for the ‘World’s Most Spectacular Sundowner Spots’. The tram is available for transfers and private bookings, including across the bridge and border from Palm Grove to Livingstone station in Zambia, and trips to Jafuta and Sekuti, drop off point for the Victoria Falls Private Game Reserve and many other activities. 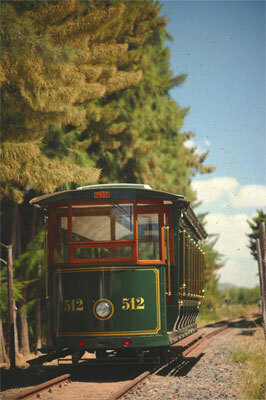 The tram is also fully fitted and licensed for night-time trips such as moonlight dinners. Victoria Falls Bungee held a charity fundraiser in August to launch the start of their new bungee option. For two nights thrill seekers with that slightly lunatic twist could throw themselves off the bridge into the void, illuminated only by the silver light of the full moon. Proceeds from the event went to two causes, Rose of Charity (which is based in Chinotimba in Victoria Falls and helps local orphaned children) and Overland Missions (which operates in Zambia). Following the success of the event Full Moon Bungee jumping has been added to the portfolio of options, so time your visit to the Falls for the full moon and you too and join the exclusive lunatic bungee jumper club! The Zambezi valley and surrounding areas seem to be under so much pressure at the moment, from the destructive forces of man. As man tries to squeeze every last resource out of the planet. The Batoka Dam project featured below is just one of the threats. Mining of the Ruckomechi and Chewore Rivers (Save Mana Facebook) is also of major concern as is the over development of safari camps along the river without proper environmental impact studies. The good news is that many of these proposal are actually shelved due to the opposition rallied by environmentalists, well done to all those who stand up and fight, sometimes it seems in vain but it does work. For instance, I spoke to a safari camp owner yesterday who has been granted another concession in the lower Zambezi but he is wanting to abandon the whole project because of the strong opposition he is facing.... Hooray! "If you destroy something made by man, and replaceable you are called a vandal, if you destroy something made by God that is irreplaceable you are called a developer"
Earlier this year it was announced that proposed Batoka Gorge Power Station development had been resurrected by the governments of Zambia and Zimbabwe. The Zambezi River Authority, which manages the Kariba hydroelectric facility, is commissioning of feasibility studies for the environmental and social impact of the project and has applied for US$3 billion of World Bank funding. Read about the development here – Batoka Gorge Dam Developments. The sun, the colour of a crimson breasted shrike’s crimson breast, was struggling up through the smoke and dust induced haze, as a tiny Cessna six seater plane, rumbled down the rutted Main Camp runway, lifting off towards the rising orb. Pat Cox at the joystick, with four passengers, was off on the next leg of the pre-game count fly over to check on the status of the available water in the park. This particular morning’s sortie was to inspect the pans along the eastern and southern part of Main Camp, inspecting water along the way – past the Kennedys, the Hide and Somalisa concessions, Ngweshla and the whole of the Wildnerness concession, before going on down to the southern most tip of the park on the Botswana border, where there had been a report on suspected elephant poaching Read the full report by clicking here. Feel free to contact us with any questions, queries, ideas or criticisms.